A pair of townhouses that face one another over a drivable courtyard, these two houses are like siblings—related but not identical. They both have three floors with double height living spaces that create visual drama. We have used bus graphics for the glass walls that face each other in order to allow in light but retain privacy. The graphics for these panels was developed from images that the owner shot and manipulated. 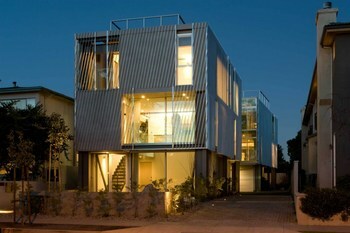 The rest of the building skin is composed of a shade screen created by diagonal, 1” x 2” aluminum angles. The front house is on the street and so it orients outwards from the lot, with a double-height living room that is opens directly into the front garden. The garden has a Zen-like feeling with two large boulders set into gravel and a specimen tree. The kitchen, dining room and media area are on the second floor, with two bedrooms on the third floor. The rear house orients to an exterior garden on the rear of the house. The kitchen / dining room is on this level so that when the large sliders are open it creates an indoor/outdoor flow. A pair of two-story raw steel panels, custom-designed for the project, fold out from the wall to create a hood and sconce covers. The second floor living room, with its glass railing and glass walkway, overlooks the kitchen. Three bedrooms are on the third floor, each with its own full bath. Green materials and strategies include passive heating and cooling, natural daylighting, shade screens, bamboo flooring, high-performance glazing, kitchen cabinetry from FSC-certified wood, recycled glass countertops, low-flush toilets, low VOC paint, and more.